Now some folks call this an apple green satin shirt and others are more firm in their belief that this is a lime green color satin dress shirt. Which ever side of the fence you're on, one thing remains clear as the ring of a bell. This apple or lime green color satin dress shirt has the silk touch that you're looking for and has visual impact that will get you noticed in a big way.Especially if you wear them for Salsa dancing or any other type of dancing for that matter. Make sure you wear Stacy Adams Shoes because they are perfect for dancing. 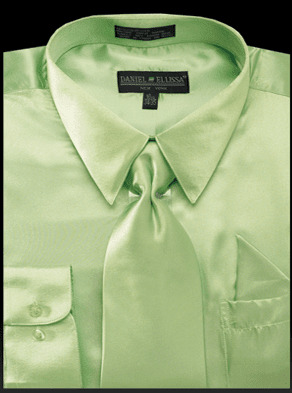 This shiny lime green satin dress shirt comes as you see it with a matching lime green tie and hanky set and is ready to get your party started. Shop for the right Tuxedo here.